Trademark Vacations Travel Tip: Visit before sunrise for views without people and to witness the sunrise over the gothic towers. The Charles Bridge (Czech: Karlův most [karˈluːf ˈmost] ) is an historic bridge that crosses the Vltava river in Prague, Czech Republic. Its construction started in 1357 under the auspices of King Charles IV, and finished in the beginning of the 15th century. It was originally called the Stone Bridge (Kamenný most) or the Prague Bridge (Pražský most) but has been the “Charles Bridge” since 1870. 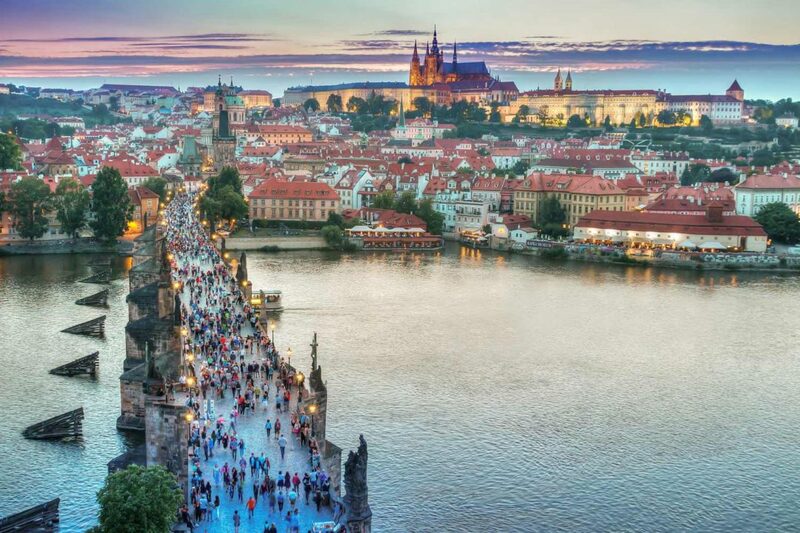 As the only means of crossing the river Vltava (Moldau) until 1841, the Charles Bridge was the most important connection between Prague Castle and the city’s Old Town and adjacent areas. The bridge is 2,037 ft long and nearly 33 ft wide, following the example of the Stone Bridge in Regensburg, Germany it was built as a bow bridge with 16 arches shielded by ice guards. It is protected by three bridge towers, two of them on the Lesser Quarter side and the third one on the Old Town side. The Old Town Bridge Tower is often considered to be one of the most astonishing civil gothic-style buildings in the world. The bridge is decorated by a continuous alley of 30 statues and statuaries, most of them baroque-style, originally erected around 1700 but now all replaced by replicas. Charles Bridge has undergone extensive repairs in the previous 100 years. In 1978, there was a major reconstruction effort, which resulted in a pedestrian only bridge. Among the most notable sculptures, one can find the statuaries of St. Luthgard, the Holy Crucifix and Calvary, and John of Nepomuk. Well known also is the statue of the knight Bruncvík, although it was erected some 200 years later and does not belong to the main avenue. Beginning in 1965, all of the statues have been systematically replaced by replicas, and the originals have been exhibited in the the National Museum.